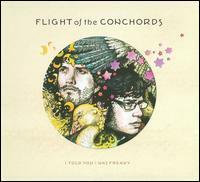 Flight of the Conchords is a comedy duo from New Zealand. Jermaine Clement wears black-rimmed glasses and has a very deep voice, and Bret McKenzie has curly hair and has the most luck with the ladies. They have their own HBO television series, which should be required viewing for everyone, in which they play versions of themselves. You can hear all these songs on that show in music video form, which are cleverly worked into the show’s plots. These songs are very funny, but they’re even funnier if you hear them with the music videos. Comedy albums are usually very scattershot. Typically, the emphasis is not on the music, melodies and arrangements, but solely on the lyrics. The lyrics could be funny as hell, but I can’t really enjoy a song if it’s otherwise bland. Well, the songwriting is usually very good. Even though they have obvious targets, they avoid the pitfall of sounding too annoyingly like the bands. That’s the reason I will never intentionally listen to The Rutles... The Rutles are funny, but the music is so close to the original Beatles songs that it gets terribly annoying. The only track that starts to bug me is in that respect is perhaps the David Bowie parody, but the rest of them would have made decent songs in their own right. Most of them have interesting song development, catchy vocal melodies and fresh harmonies. These guys aren’t just funnymen; they do know a thing or two about songwriting. The oldest style of songs they parody is ‘50s and ‘60s French pop with “Foux du Fafa,” which was also my favorite segment in the show. Perhaps the reason it was my favorite is that I took French in college, and the image of those guys touting speaking what little they knew of French hit very close to home. Plus, the melody is very sweet and hooky... the way they bring in that little disco dance part at the end earned them extra credit. “Robots” is a terribly popular song of theirs and that comes to no surprise considering how funny it is. It’s an out-of-date sci-fi song that takes place in the distant year of 2000 when robots killed all the humans and took over the world. Practically every line in that song evokes a laugh... if nothing else, you should hear that one. “Business Time” is a really, really funny Barry White parody. Jermaine has the perfect voice to provide that mumbling bedroom talk throughout the song. Even though it’s a parody, it’s striking how much more honest and realistic these mumblings are. (I always imagined that White would have gotten slapped in the face if he actually said any of that stuff to women.) Once again, not only is the parody funny, but the song has a good pop hook of its own, which makes it even that much more enjoyable. Perhaps the most famous piece from the album is a parody of one of those rap-off competitions “Hiphopopotamus vs. Rhymenoceros.” The lyrics are hilariously lame, and it also produced one of the most memorable music videos from the show. There are just two songs out of the 14 that I find rather boring. (There are 15 tracks, but the last one is just a 20-second snippet, so it doesn’t count.) I don’t find “Leggy Blonde” neither catchy nor funny... the gimmicks in it, such as the office supply medley in the middle, were cute but ultimately didn’t help me enjoy the song much. “A Kiss is Not a Contract” is an OK acoustic folk song, but also not something I find too special. But those are just two songs, and they got Bs. If you’ve watched the show, you’ll probably notice that there are a few songs missing. For example, the “Puff the Magic Dragon” parody isn’t here and neither is that Lord of the Rings sequence. But for the most part, I think, they included their best songs for the album. If you enjoy deadpan humor, you should watch the 12-episode HBO series very soon. 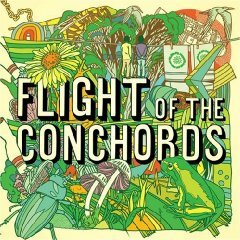 If you enjoyed that to pieces (which I’m sure you will considering it’s probably the funniest music comedy since Spinal Tap probably), then do get this album. Now I think The Flight of the Conchords know what John Cleese meant when he said that it's nearly impossible to make people happy with a follow-up to an extremely popular series. When their second season was first aired on HBO, the common reaction to it was that it was not as funny as the first, and the songs weren't very good. When I eventually got around to watching it myself (the week it was released on DVD), my gut reaction was to agree with that sentiment. While I found it to be funny, I was constantly plagued with the notion that it just didn't measure up. 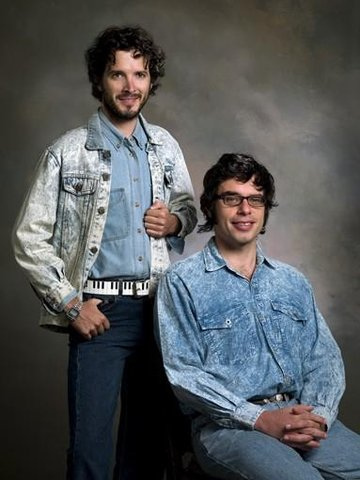 Poor Flight of the Conchords. They made the first season too good. But taking a step back from that initial reactions, and repeatedly listening to their album I Told You I Was Freaky, which contains songs exclusively from the second season, I've reversed that. These songs are good. Very good. That's amazing since they had something like 10 years to develop the material on the first album, and only a year to develop this. They put all their diverse novelty songs at the end of the album for some reason, and most of them are quite good. “You Don't Have to Be a Prostitute” is a reggae-pop song and obviously a goof on Police's “Roxanne” even though that was a tango. “Friends” is a cheeky a cappella number, and a joy to listen to. “Carol Brown” would be nearly indistinguishable from classic Kinks if it weren't for the mildly detectable synthesizer and those cheesy finger snaps. Flight of the Conchords announced earlier this month (December 2009) that they weren't returning for a third season, which disappointed me, but it's hardly the end of the world. I shall spend the rest of my days looking forward to seeing/hearing what else they come up with. Maybe one day I'll even go to one of their live shows if I ever get the opportunity. (I'm keeping my fingers crossed for a motion picture!) I'm sure that future generations of Flight of the Conchords fans will equally enjoy both seasons just as I equally enjoy both series of Fawlty Towers. They're comedy classics. And the albums are classics, too. Yes, this was apparently an album review.